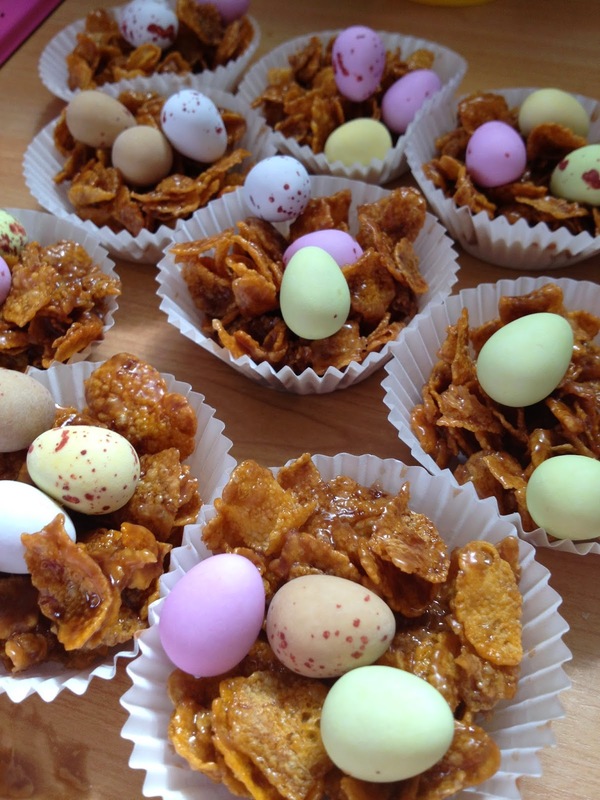 What is Easter without the traditional chocolate egg nests? We had a few moments free while Little W napped this morning and 3 year old B was keen to make some nests she'd seen the recipe for in her magazine: Redan's Fun To Learn Favourites. The recipe was actually for a Mike The Knight version called Chocolate Dragon Nests. So, we donned our aprons and headed for the kitchen for some cookery. The recipe is a simple one, which uses mainly store cupboard staples. There are plenty of opportunities for a 3 year old to get involved, despite the need to melt some of the ingredients on the hob. 100g milk or dark chocolate, broken into chunks (we used milk chocolate which results in a slightly less chocolatey colour but is probably more palatable for younger children). 1. B helped to weigh out the ingredients and put the butter and chocolate into a saucepan while I measured out the golden syrup. B then helped me scrape the syrup off my spoon into the saucepan. 2. B put the cornflakes into a large bowl while I melted the butter, syrup and chocolate over a low heat. 3. I then poured the melted chocolate mixture over the cornflakes and B did the stirring. 4. We both spooned the mixture into cupcake cases and B then started making small holes in each one so she could put three mini eggs into the nests. 5. I then popped the nests into the fridge to set. We can't wait to try them out. She absolutely loved making them and the whole family has enjoyed eating them.